Visitors with a special interest in antiquities will be stunned when visiting the Ashmolean Museum at Oxford University, not only because of the great quality of ancient art and artifacts on view but also because of the key role that many of these objects have played in the development of fields such as archaeology and art history. 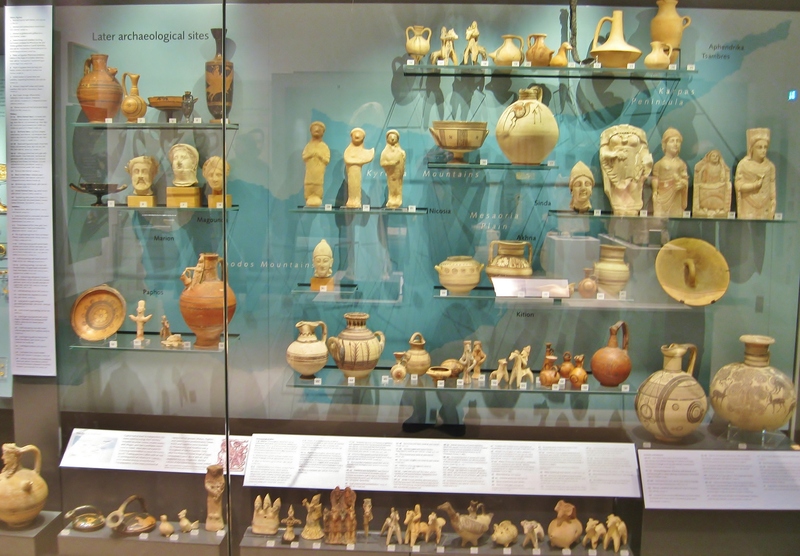 The Ashmolean in its present form was created in 1908 through the merger of two very old Oxford collections: the University Art Collection, begun in the 1620s, and the original gift of antiquities and curiosities from Elias Ashmole in 1692. Gifts of art and artifacts continued until by the early 19th Century the galleries had become a must see for visitors to Oxford. The superb neo-Classical building was completed in 1845 and has expanded since. Later, through the work of such distinguished scholars as Sir Arthur Evans, antiquities obtained through modern excavations poured into the collections. Today the Museum houses extraordinary Near Eastern, Egyptian, Aegean, Cypriot, Greek, Etruscan, Roman and related antiquities, well worth the train ride from London or elsewhere. The galleries are not arranged in a strict chronological fashion but by geographic region. This allows a somewhat freer flow for the visitor. The spaces are open and easy to navigate, without the crush of dense crowds one often gets at The British Museum. Objects are thoughtfully displayed and quite well lit, though the bright lights sometimes create too much glare on the cases for successful photography. The staff is helpful, facilities of all types are easily available, the cafe is excellent and the gift shop carries a good selection of antiquities related books, catalogs, etc. 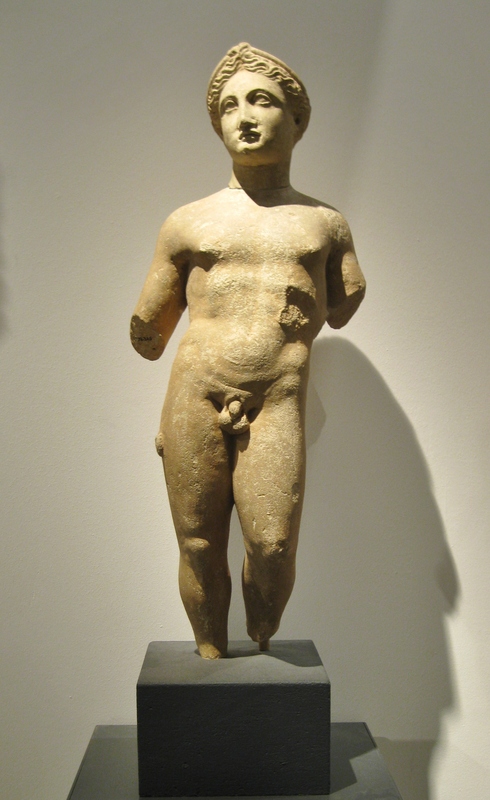 All images and caption presented here must be credited to: Clio Ancient Art and Antiquities. Enjoy. 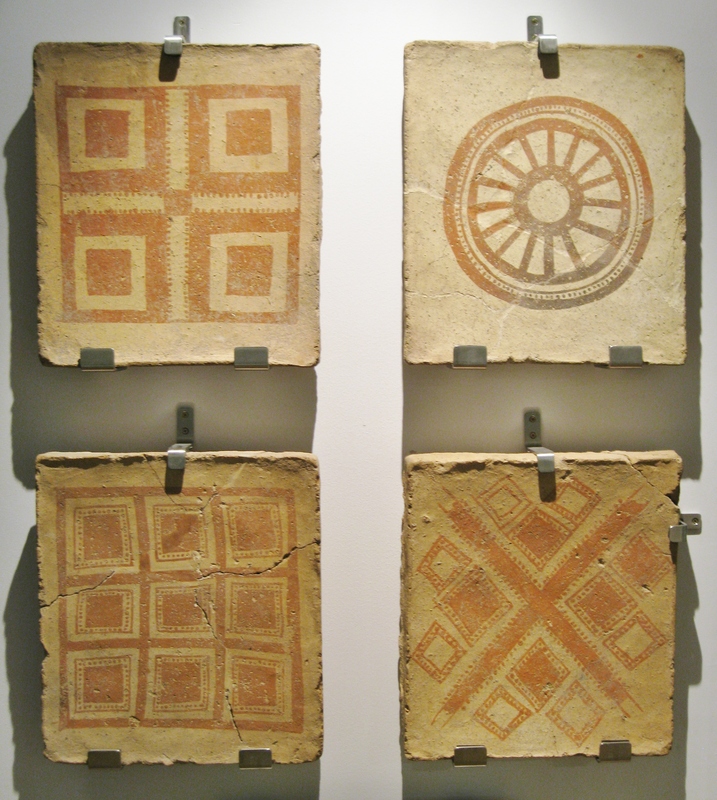 Painted terracotta tiles from the Iron Age ceremonial building called “The Painted Chamber” at Baba Jan, Iran, dated to about 800-700 BC. 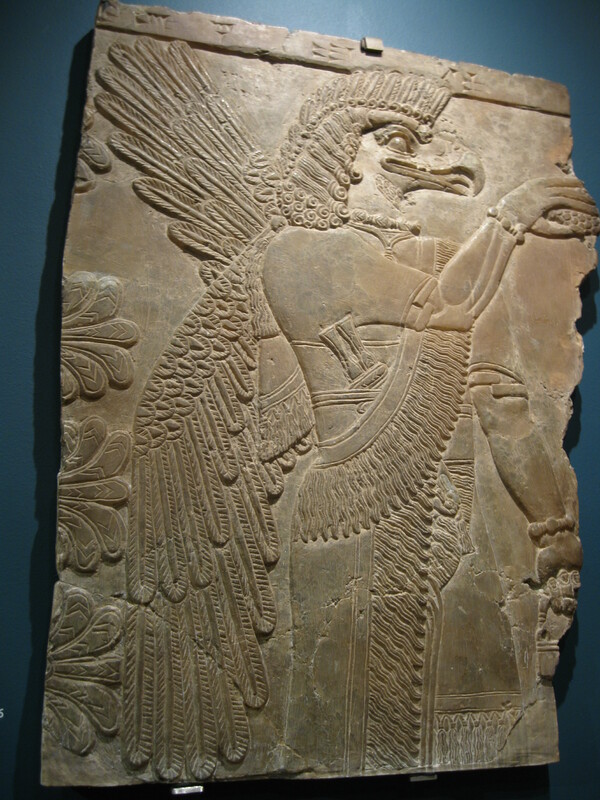 Assyrian winged genius from the Palace of Ashurnasirpal (883-859 BC) at Nimrud, Irag. He holds a pale of water and a pine cone to be used in a manner similar to “holy water” in modern churches. Acquired through excavation by A.H. Layard in the early 19th Century. 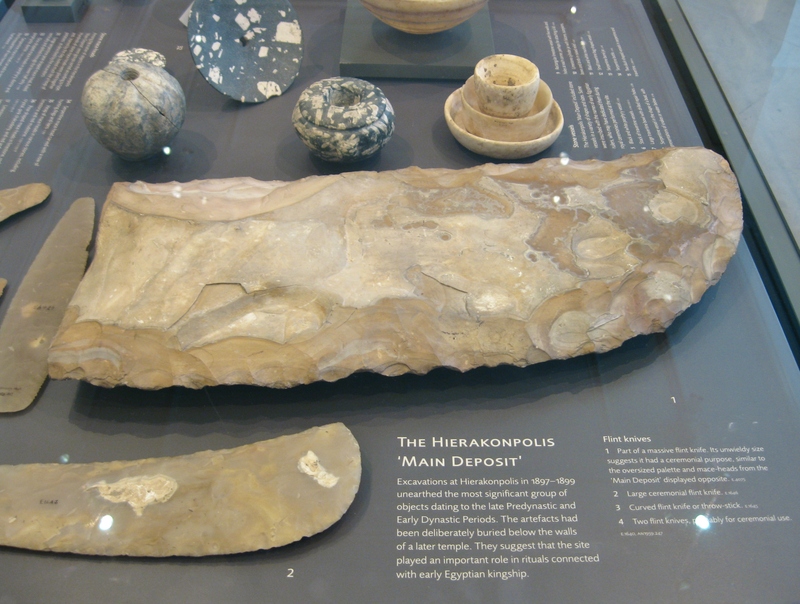 Large ceremonial flint knives and other tools from the Hierakonopolis Deposit, an important group of Pre-Dynastic and Early Dynastic Egyptian objects. 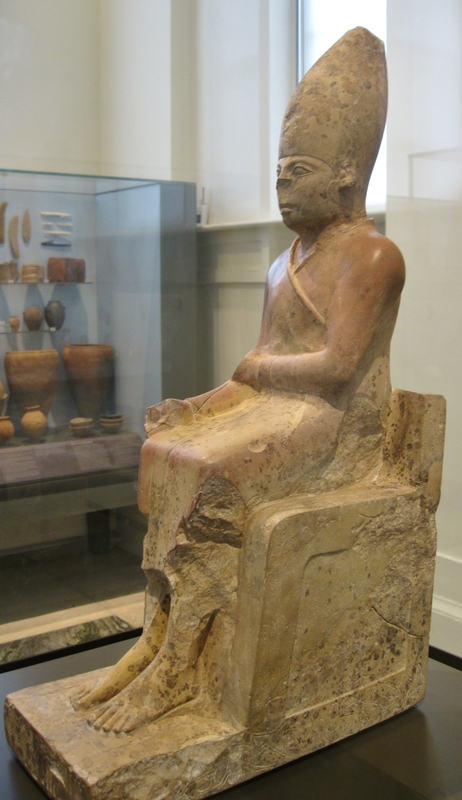 Statue of Khasekhem, last king of Egypt’s 2nd Dynasty, died 2,686 BC. In this pose he wears the White Crown of Upper Egypt. One of his sons Djoser, would be responsible for building the famed Step Pyramid at Saqqara. 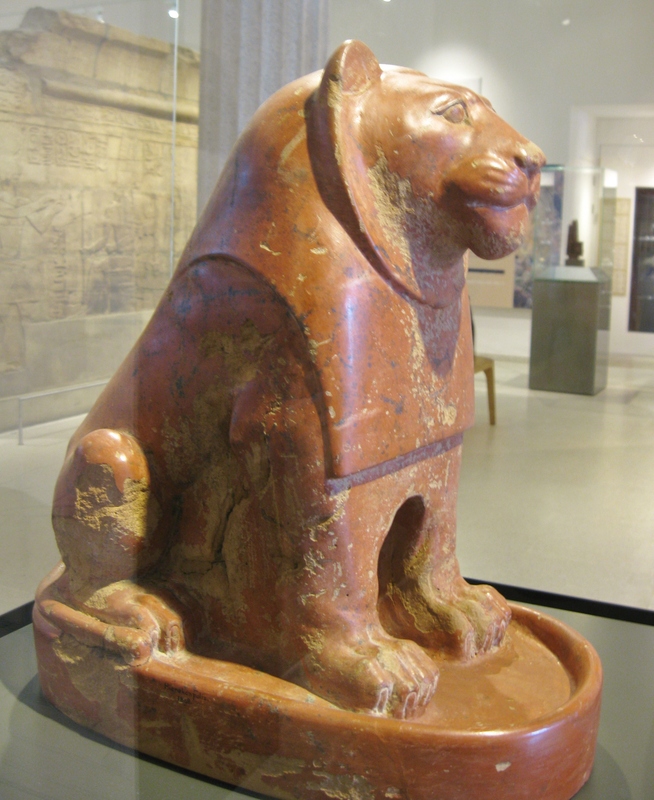 A large pottery lion from the Temple Enclosure at Hierakonopolis, Egypt, dating to the 6th Dynasty, about 2,325 to 2,175 BC). Appearing at first glance to be made of stone, this magnificent and technically accomplished work is, in fact, hollow pottery, resting on a plinth. Fragments of another lion were found at the site and the two may have served as guardians of the Temple precinct. 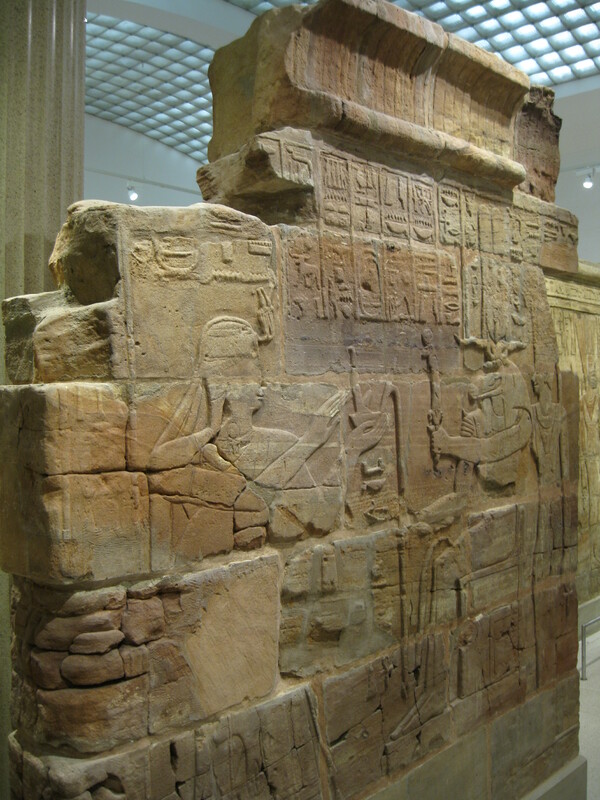 Sandstone wall of King Aspelta from Temple T at Kawa, circa 600-580 BC. The Kingdom of Kush, to the south of Egypt in what is now Sudan, adopted Egyptian art, religion and funerary practices wholesale, adorning their capital cities and royal tombs in the Egyptian style. Here, King Aspelta offers Ma’at (Truth) to the ram headed god Amun-Re. 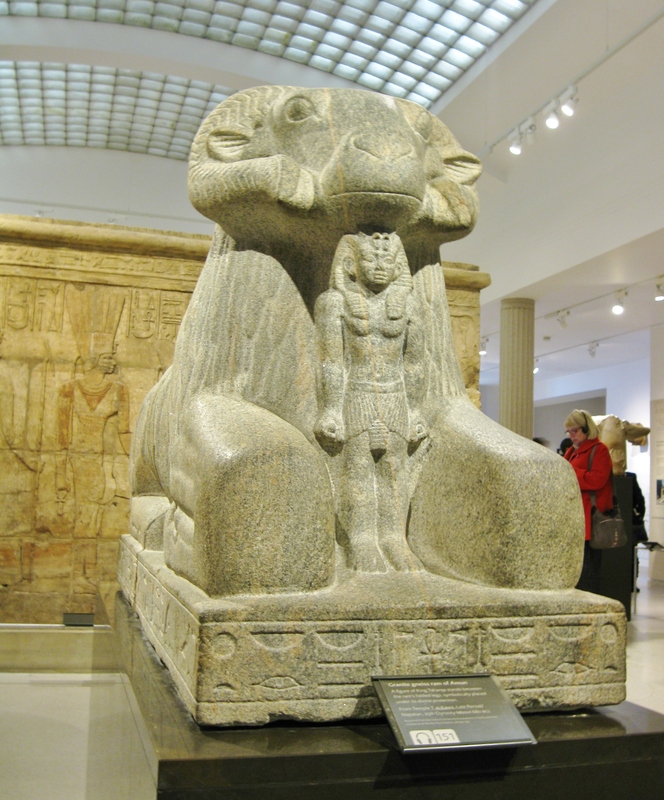 Granite statue of the god Amun in the form of a ram protecting King Taharqa. Dating from about 680 BC, this is also from Temple T at Kawa and was uncovered during excavations in 1931. 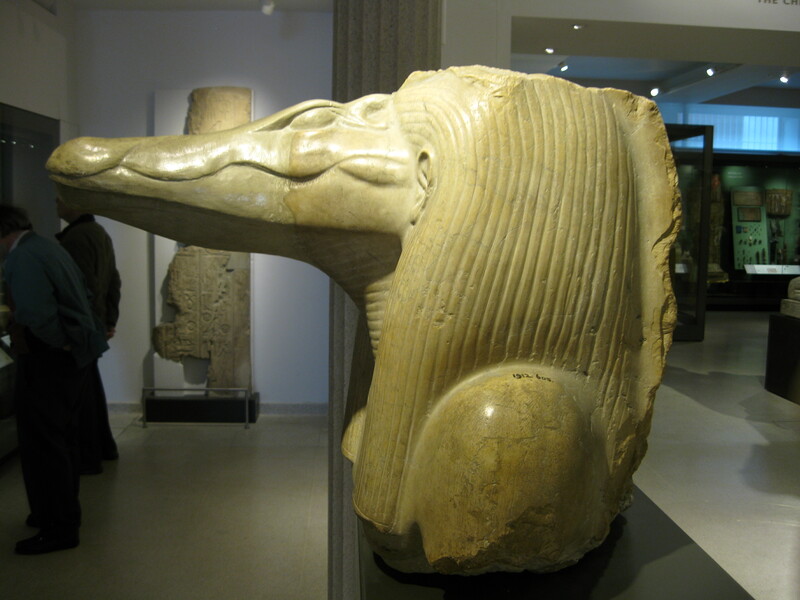 It has a twin in The British Museum. 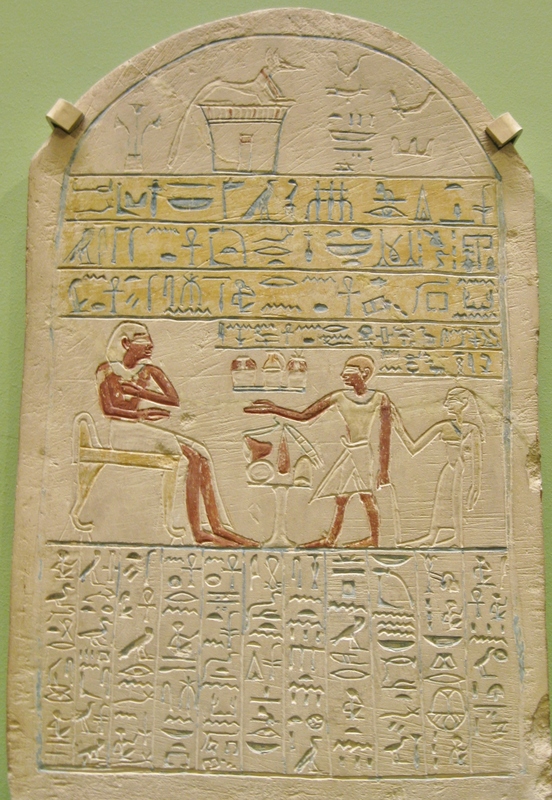 Painted Egyptian limestone grave stela of Reniseneb making an offering of food to his father Redysankh, while a scribe sits at right. 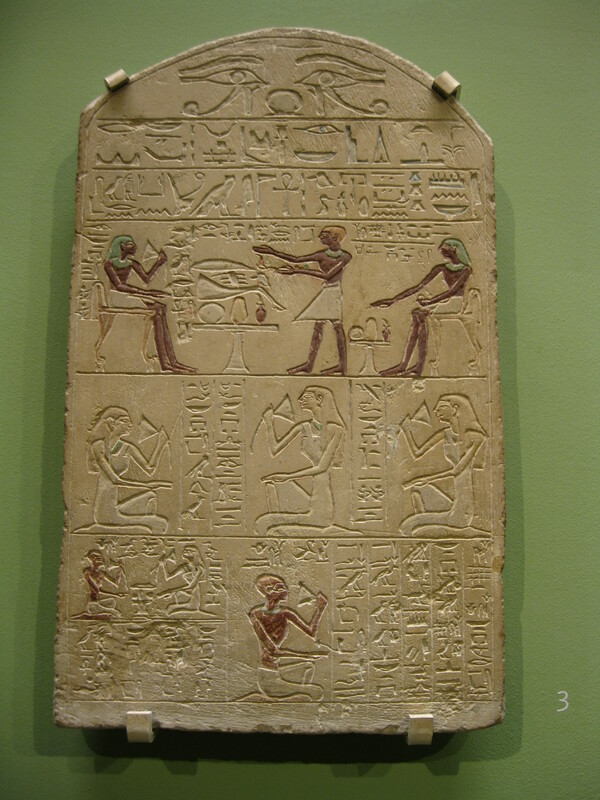 From Abydos. Middle Kingdom. 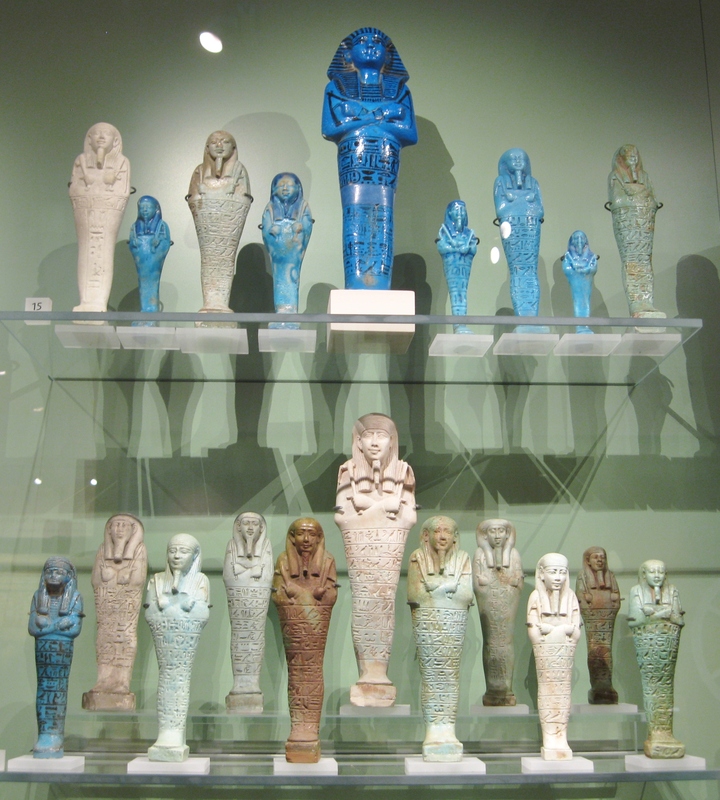 Egyptian funerary amulets were placed on the body and in the mummy wrappings, representing funerary deities or parts of the body requiring special magical protection. 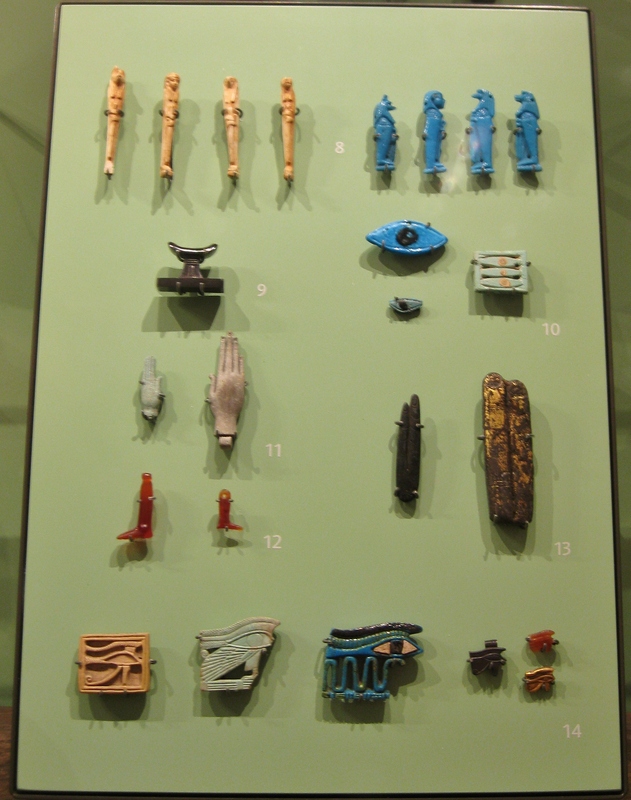 Examples shown here are made from colored faience, hematite, carnelian and gold foil, and date mainly to the New Kingdom and Late Dynastic Period. 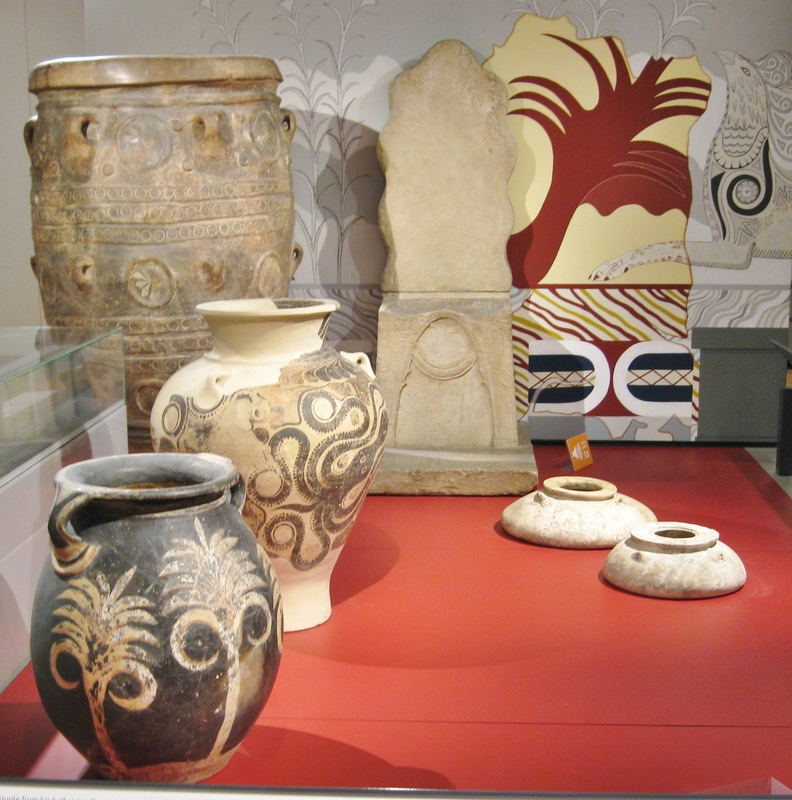 A display of superb Minoan pottery from the palace complex at Knossos, Crete, Circa 1,700 BC. Excavated by Sir Arthur Evans. 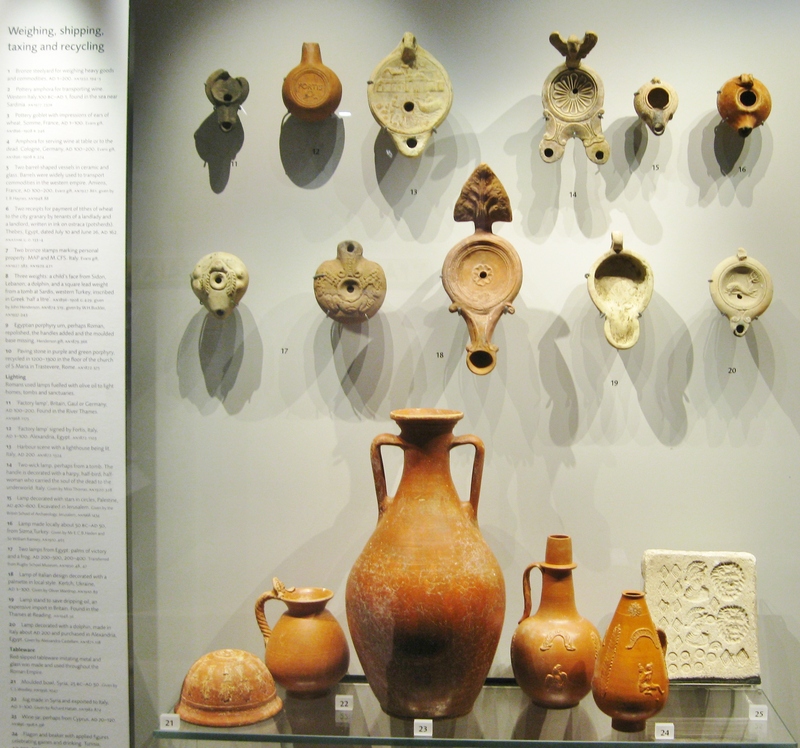 A display of superb Minoan storage pottery from the palace complex at Knossos, Crete, Circa 1,700 BC. Excavated by Sir Arthur Evans. 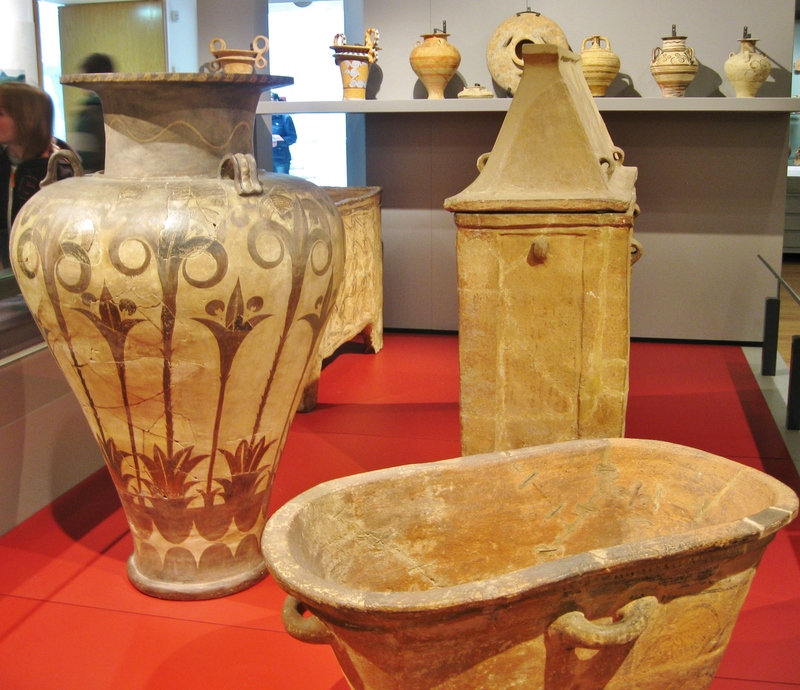 A staggering display of Cypriot pottery, mainly from the Iron Age but also running through the Classical, Hellenistic and early Roman periods. A superb Greek red figure pottery pyxis (jewelry box) of the 5th Century BC from Athens, accompanied by Greek gold jewelry of the Classical and Hellenistic periods. 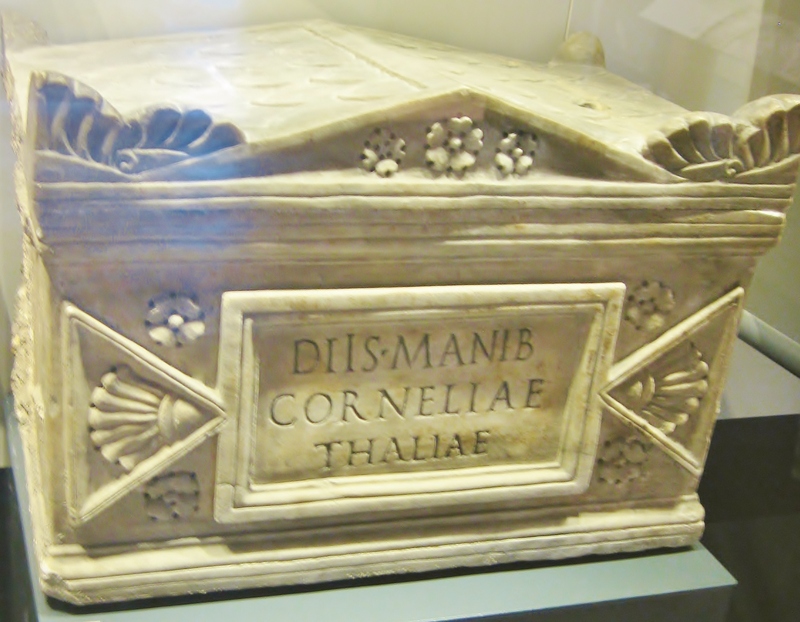 Cinerary box of a Roman woman named Cornelia Thalia, about AD 50-75. This finely made marble box from Rome is in the shape of a shrine and includes Latin text dedicated to the departed spirits of the deceased woman, whose cremated remains were kept inside. 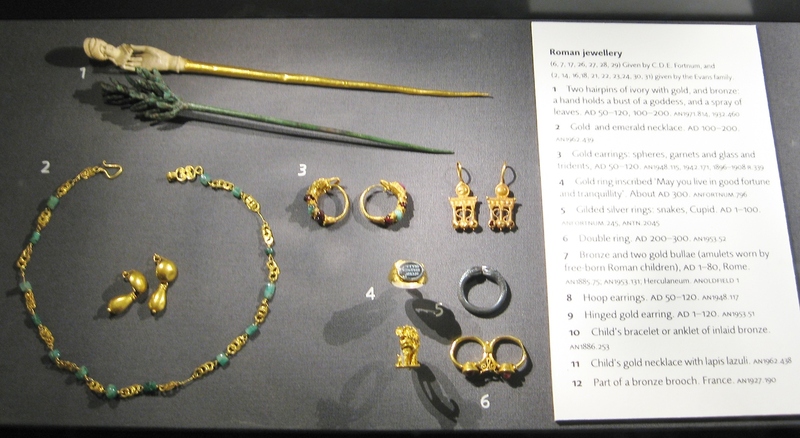 Part of a display or Roman Jewelry, including objects of gold, silver, bronze and bronze that has been tinned, gilt, silvered or enameled, as well as glass, precious and semiprecious stones, jet and other materials. The types include earrings, necklaces, rings and hairpins, with a great geographic distribution, from what is now Syria and the Levant in the east to England in the west, and spanning 500 years. 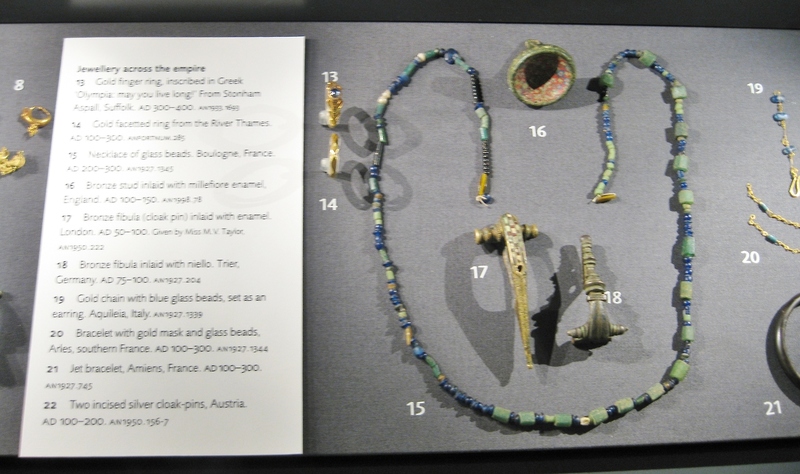 Parts of a display or Roman Jewelry in the Ashmolean Museum, Oxford, UK. Included are objects of gold, silver, bronze and bronze that has been tinned, gilt, silvered or enameled, as well as glass, precious and semiprecious stones, jet and other materials. The types include brooches, earrings, necklaces and clasps, with a great geographic distribution, from what is now Syria and the Levant in the east to England in the west, and spanning 500 years. Just Phenomena. The tyles resemble the Patern seen in the Kuba cloth from Congo.